Click here to download our brochure or click image below to see our digital brochure! 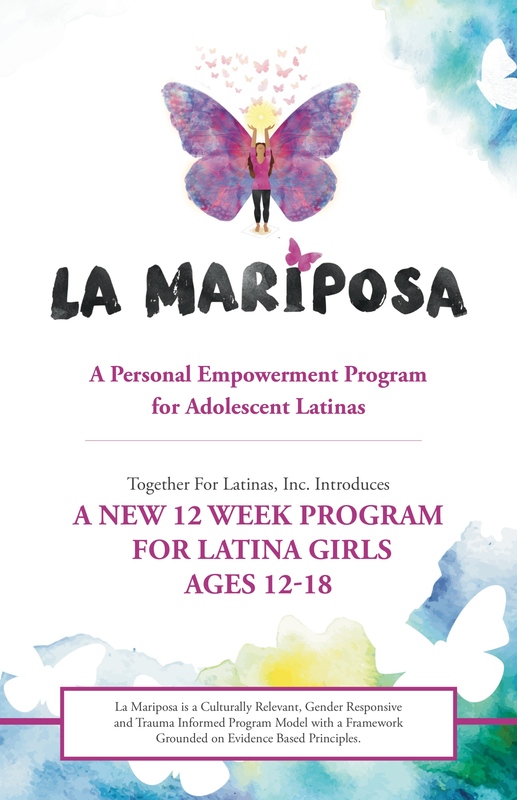 La Mariposa: A Personal Empowerment Program for Adolescent Girls is a gender responsive, culturally competent group program model for adolescent females from 12 – 18 years of age. The vision of the program model is to offer Latina girls a 12-session group curriculum that provides support through the multiple challenges that they typically face. The program is a “personal empowerment program” that can be used in intervention and prevention settings, as it teaches practical skills that can help intervene in cycles of self-doubt and negative self- talk which many adolescent girls experience. Through experiential activities, lively discussions, and discovering the truth within, these skills (called JARS – Journaling, Affirmations, personal Rules and Setting goals) can positively impact the direction of their lives. All sessions are facilitated in a relational, strengths-based, trauma informed and culturally competent manner. Two main strategies were employed in designing La Mariposa. First, a review of the research on gender specific programming was conducted, focused on relational, strengths-based, trauma informed and culturally competent practices. This step ensured that the program design, development process, and method for selecting session activities were aligned with theory and research on culturally diverse adolescent girls. Second, several interviews and f ocus groups were held both with past facilitators and participants of an earlier Together For Latinas. workshop process. This was essential to ensure that girls had a voice in the program design – a basic tenant of good gender responsive practice. The model is, at its core, rooted in the Latina experience. This was a critical element that we worked hard to maintain throughout the model. Help girls develop healthy relationships with themselves, others and their community. Provide girls with compassionate, culturally sensitive, and inspirational role models to share success stories and to listen to them. Provide girls with an understanding of the value and importance of education in the development of their aspirations. Reinforce a sense of pride and connection with Latina culture.